Don’t Panic! (or should that be rejoice?!) The fast-food chain we love to hate hasn’t been subject to some kind of McDisaster. 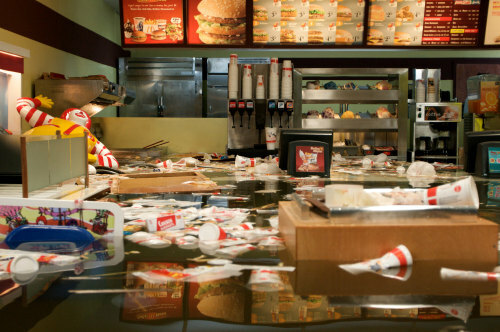 Rather, this is the latest installation from the Danish art-collective Superflex entitled “Flooded McDonald’s”. Created from scratch in a matter of months this replica burger-joint outlet was submerged and the resulting film was shot in just one take. It’s certainly provoked me to think more about capitalism, consumerism and the affects that these seemingly unstoppable behemoths can and are having on our planet. We need to take purchasing decisions into our own hands and really think about we’re buying. In becoming Consumer Activists we can not only buy with a conscience but Keep an eye on the corporate world around us. Also, if you haven’t already seen it, it’s worth checking out Morgan Spurlock’s Supersize Me. This unmissable documentary caused some tongues to wag and heads to roll when it came out and it remains a great watch; revealing the true cost of a fast-food, over-the-counter culture. Watch a preview of the film below and let us know your take on this inspirational piece of work.